The axes give the logarithm (base 2) of the return time horizons dt used to compute the volatility. the time interval dT over which the squared returns are summed. In this graph, dT is fixed: dT = 512 x 3 minutes = 1 day 01:36. The return time horizon dt is changed, with dt = 2(n-1)x 3 minutes. The value for n is given on the axes. Large (small) value for n corresponds to a coarse (fine) grained definition of the volatility. This graph shows the correlation between the historical and realized volatility, with fixed dT and different dt. Notice that with a coarse definition of the volatility (large value on the axes), the number of returns used to compute the volatility is small, and hence the statistical volatility estimator has a large variance. This effect leads to the lower correlations on the upper border and the right border. The efficiency of the estimator is combined with the "graining" effect to produce the observed graph. The asymmetry in the previous figure. 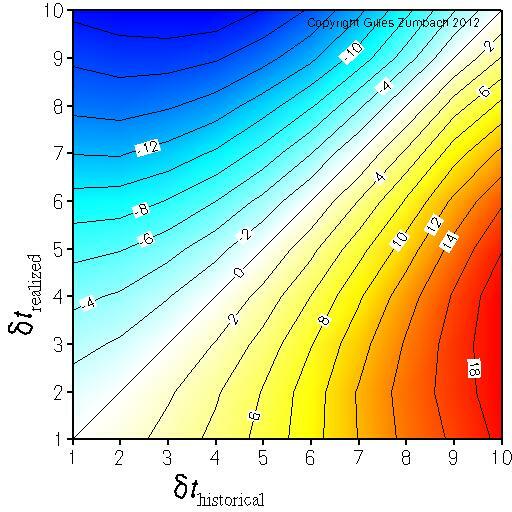 This measure the asymmetry in the correlations between historical fine grained and realized coarse grained versus historical coarse grained and realized fine grained volatilities. 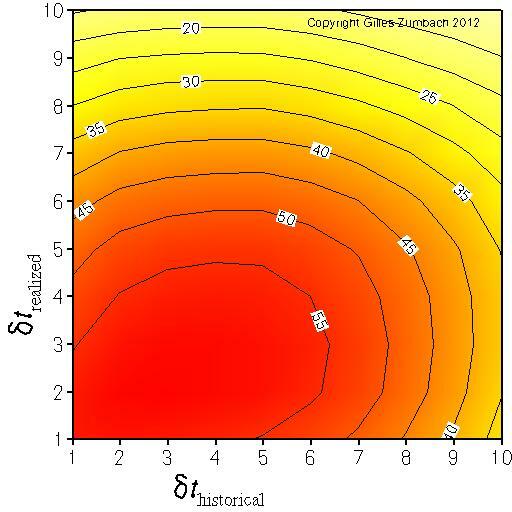 The positive asymmetry (yellow - red) in the lower right corner indicates that historical coarse grained volatility predicts better realized fine grained volatility than the other way around.